When was the last time you did a 540°? Have you ever used “architect” as a verb? Do you have enough bandwidth to growth-hack the analytics? I had a chance to reflect on this when my summer reading pile included House of Lies: How Management Consultants Steal Your Watch and Then Tell You the Time, written by a former consultant for McKinsey & Company. That book became the basis of a Showtime series of the same name, starring Don Cheadle. Communications Tip of the Month: Say what you mean and mean what you say. The next time you see a word or hear a phrase that is either stale (e.g., “game change,” “perfect storm” or “the times, they are a-changin’ ”) or unnecessarily opaque (e.g., “Should we start by triangulating the hypotenuse?”), don’t be afraid to fight for clear, simple, persuasive and understandable English. I have encouraged friends and clients to throw me out of any meeting when I drop buzzwords like that. (So far, I have not been thrown out of a meeting.). For a hilarious send-up of vapid stuff businesspeople say, my highest recommendation goes to a video produced a few years ago by Avaya (see below). It’s an absolute scream — I encourage you to put on your ear buds and listen to it several times, as some of the buzzwords zip by so rapidly that you can barely catch them. From time to time, I blog and speak on the need for clarity and precision in written and spoken communications. 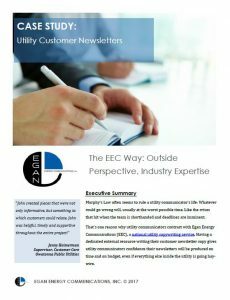 This can be especially hard in the utility industry due to the complexity of the subject matter and the prevalence of acronyms. When I hear “smart talk” in the workplace, I am reminded of the Greek myth of Sisyphus, who angered the gods and was condemned to roll a rock to the top of a hill, push it off a cliff, and go back to the bottom of the hill to repeat the same exercise indefinitely. In a social media world, and a business environment filled with buzzwords and jargon, is advocating for straightforward, clear copy a Sisyphean gesture, so “old school” as to be pointless and futile? Nope. Every now and then, I get a supportive call or an email from a subscriber, or I’ll receive a “thank you” at a conference, and my heart sings because I have helped someone. Producing straightforward written (and spoken) communications, where you say what you mean and mean what you say, is (or should be) the goal to which all communicators should aspire. Achieving that goal is its own reward. The “thank yous” from clients, friends and colleagues are gravy. 1.“540°” is a combination of a “360°” turn and a “180°” turn. It represents coming full circle around a point, then reversing yourself to embrace the exact opposite from where you began. 2. What hill are you willing to die on” is a fancy way of asking what’s really, really important to a person or an organization. 3. “Architect” is a noun (it’s defined as someone who designs buildings), but some turn it into a verb, as in, “Billy, will you go architect that deck?” (AKA create a presentation). 4. 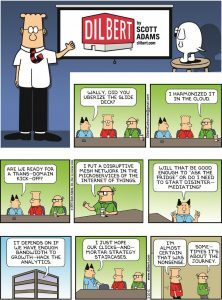 I have no idea what is meant by “Do you have enough bandwidth to growth-hack the analytics?” I suggest you contact Scott Adams, creator of the “Dilbert” cartoon strip. Better yet, banish those terms entirely from your vocabulary, since they are so opaque as to be meaningless. Check out these case studies on EEC’s writing services available to you today! Let John know what writing projects you need help with: Email him at [email protected].